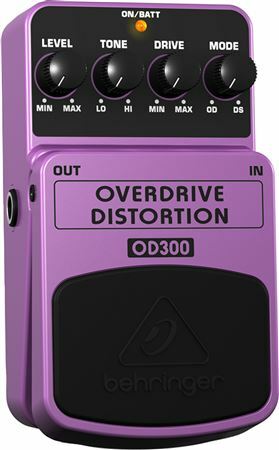 The Behringer OD300 Overdrive-Distortion Pedal has all your bases covered with truckloads of tone and a dedicated OVERDRIVE/DISTORTION blend dial. Some tunes call for an edgy modern-crunch; others call for the classic sound of hot and bothered tubes. Some need a little of both. 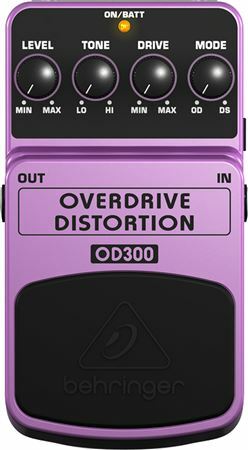 The Behringer OD300 Overdrive-Distortion Pedal has all your bases covered and now you can get yours at American Musical Supply. Why settle for just overdrive or distortion when you can have both? Set your tone on fire with distortion, overdrive, or a potent blend of both with the BEHRINGER Overdrive/Distortion OD300. This is one of the best overdrive pedals I have ever owned in terms of sound and at a really great price. Iam a Professional lead guitarist 45 years I bought this pedal for my 12 year old daughter who is playing guitar one year, Behringer pedals are very good pedals for the price they are from Germany.